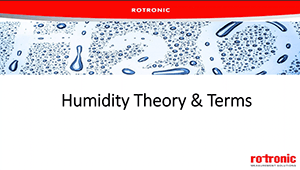 Rotronic presents the definitive humidity measurement webinar series created to help you make a more reliable, repeatable and accurate measurement of humidity. Learn the basic theory behind carbon dioxide measurement, how the most common technology works, and look at a few practical applications. 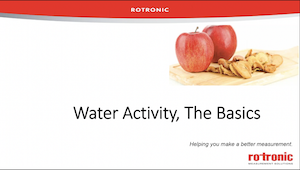 How does water activity relate to moisture content? Why should you measure it? 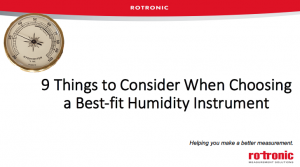 In this webinar, we'll focus on 9 things to consider when choosing a best-fit humidity instrument. 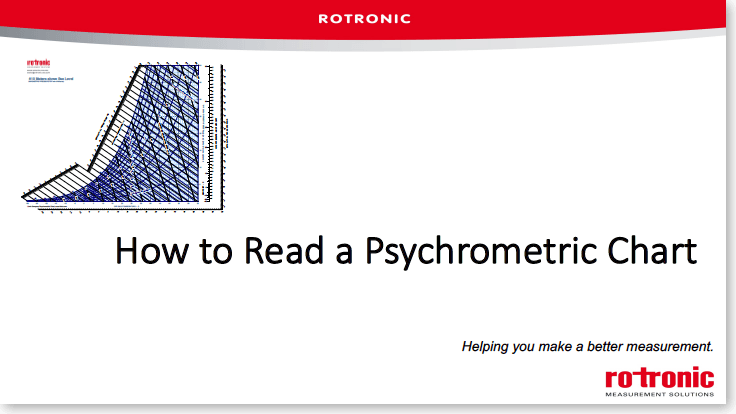 By attending this webinar, you'll learn what questions to ask and how the answers will guide you to choosing the best hygrometer for your application. 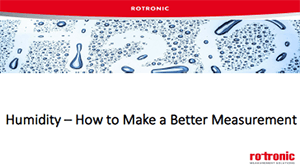 By understanding the parameter and the technology, you can make a more reliable, repeatable and accurate measurement. This webinar will introduce the questions you should be asking during your process of evaluating and choosing a monitoring system for regulated and controlled environments. Choosing the best fit system depends on your application, infrastructure, and regulatory requirements. We'll explore the complete process from start to finish. 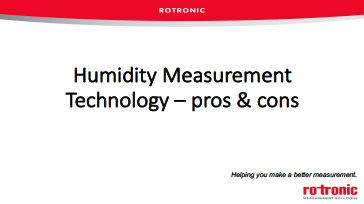 By attending this webinar you will learn about the pros and cons of the most common humidity measurement technology. Different types of technology that will be covered in this webinar include: capacitive, resistive, psychrometers, chilled mirror, metal oxide and mechanical. 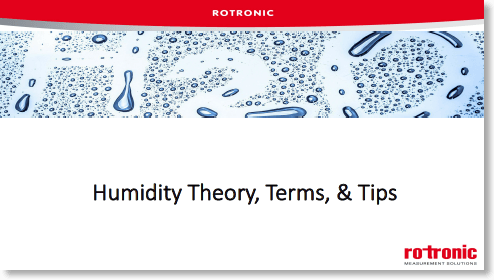 Learn about the basic science behind measuring humidity so that you can make a better measurement. 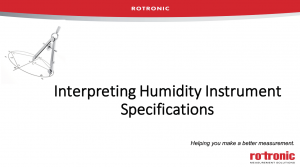 We'll cover the most common parameters used to define water vapor content in gases. 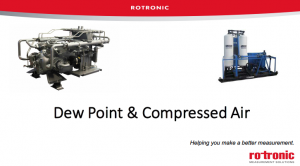 Learn how temperature and pressure affect some parameters and not others. 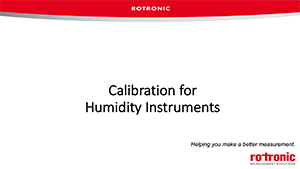 Evaluate your application to decide what parameter is best suited to your particular humidity measurement situation. 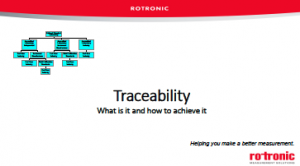 Traceability – What is it and how to achieve it – It’s not as straight forward a you think. 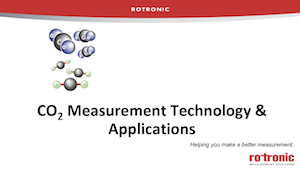 The majority of regulations (FDA) and quality systems (ISO/IEC 9001, ISO/IEC17025) which reference the requirement of calibration of measurement instruments require traceability of measurements. We often hear the requirement for NIST traceable calibrations. How does traceability affect the measurements that we take? How can I prove traceability of my measurements? 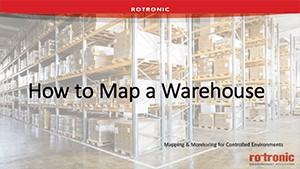 How can I ensure that my suppliers are actually providing traceable calibration results? 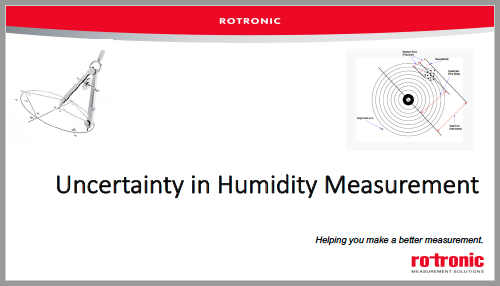 Selecting the most appropriate instrument for relative humidity measurement is not as simple as comparing the specifications from various manufacturers. The various manufacturers present the data needed to make a determination of overall instrument performance in their own unique format. Learn how to interpret the term “Accuracy”. 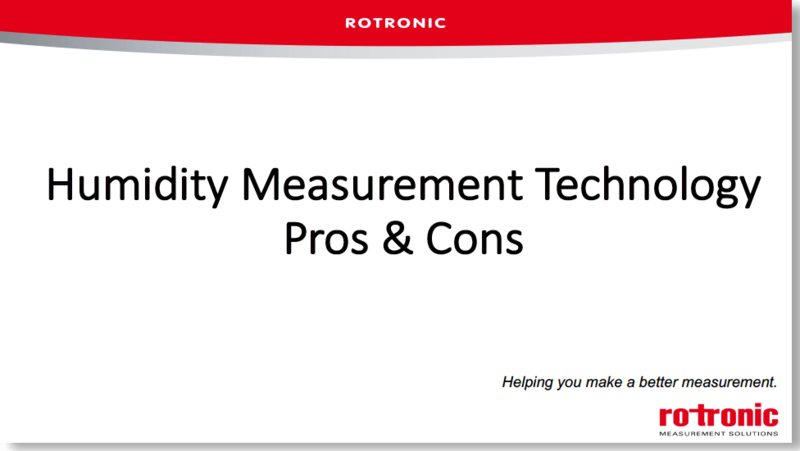 A specification titled “Accuracy” from one manufacturer may not be comparable to the Accuracy specification from a second manufacturer. Learn how to apply a methodology that can be used to objectively compare the specified performance of the instruments. 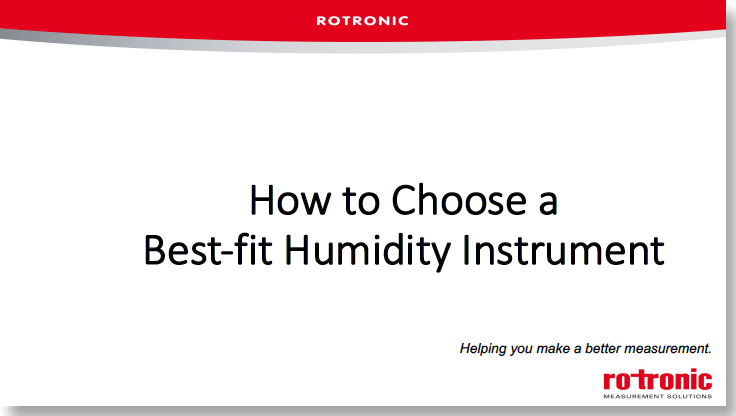 Making a better humidity measurement depends largely on choosing the best fit instrument well before you attempt to make your first measurement. 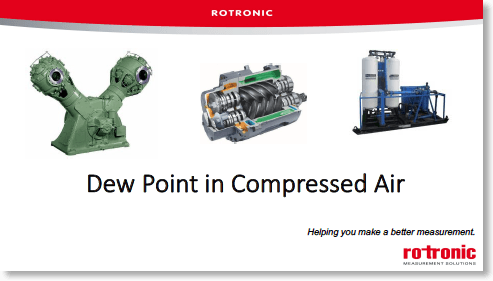 Basing your decision on these 9 points will help you zero in on choosing the best instrument for your specific application.